MyLab™ Programmingis an online learning system designed to engage students and improve results. 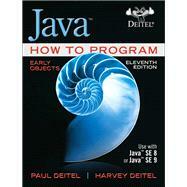 MyLab Programmingconsists of a set of programming exercises correlated to the programming concepts in this book. Through hundreds of practice problems, the system automatically detects errors in the logic and syntax of their code submissions and offers targeted hints that enable students to figure out what went wrong—and why. MyLab Programmingimproves the programming competence of beginning students who often struggle with the basic concepts and paradigms of popular high-level programming languages. For instructors, a comprehensive gradebook tracks correct and incorrect answers and stores the code inputted by students for review. Paul J. Deitel, CEO and Chief Technical Officer of Deitel & Associates, Inc., is a graduate of MIT and has over 35 years of experience in computing. He holds the Java Certified Programmer and Java Certified Developer designations, and is an Oracle Java Champion. Through Deitel & Associates, Inc., he has delivered hundreds of programming courses worldwide to clients, including Cisco, IBM, Siemens, Sun Microsystems (now Oracle), Dell, Fidelity, NASA at the Kennedy Space Center, the National Severe Storm Laboratory, White Sands Missile Range, Rogue Wave Software, Boeing, SunGard Higher Education, Nortel Networks, Puma, iRobot, Invensys and many more. He and his co-author, Dr. Harvey M. Deitel, are the world’s best-selling programming-language textbook/professional book/video authors.